The Japan Aerospace Exploration Agency (JAXA) is Japan's national aerospace agency. It was formed on October 01, 2003 and administered by the country's Ministry of Education, Culture, Sports, Science and Technology (MEXT) and the Ministry of Internal Affairs and Communications (MIC). The responsibility of the agency is the research, development, and launch of satellites into orbit. Not confined to those projects, they are also actively involved in other missions such as asteroid exploration and possible manned exploration of the Moon. 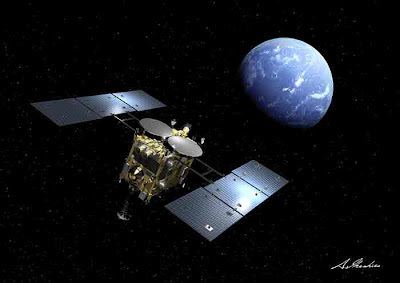 JAXA's Hayabusa mission (launched 2003, returned 2010) was the first spacecraft ever to collect samples from an asteroid and return to Earth successfully. The target of the asteroid probe was Itokawa, an asteroid with a diameter of 500 meters. Using Earth's gravitational field and ion engines, Hayabusa reached the asteroid and provided scientists a first close look of a Near Earth Object(NEO). Physics World's Dennis Normile reports that Japanese space agency, JAXA, plans to land a spacecraft on an asteroid in 2018. Its goal is to look for clues on how life began on Earth. The spacecraft, named Hayabusa 2, is the second mission of JAXA at investigating and collecting data from an asteroid. The first mission, Hayabusa, returned to Earth in June 2010. Hayabusa 2 will be launched in 2014 with a view to settling on the targeted asteroid, named 1999 JU3, in mid-2018 before arriving back on Earth in 2020. Hayabusa 2 will fire fingertip-sized bullets into the surface of the asteroid and the fragments from the impact will be collected. It will also detonate an impactor module, which will fire a 2 kg projectile into the asteroid to create a 2 m crater. Video: The Great Challenges of "HAYABUSA"
From a safe distance, the spacecraft will return to the asteroid and collect samples from the newly formed crater. Scientists believe that the material there have not been exposed to space weather and solar radiation before and will therefore have been created in the very early days of the solar system. It is thought that the asteroid's distance from the Sun will mean a better environment for preserving water and amino acids, which may add weight to the theory that asteroids and comets helped bring life to Earth. JAXA's first mission, Hayabusa, overcame engine failures, fuel loss and communication blackouts to finally return to Earth after successfully landing on the asteroid Itokawa. Tens of thousands of people in Japan watched the spacecraft re-enter the Earth's atmosphere via Internet streaming and more than 100,000 people queued at several venues around the country to catch a glimpse of the capsule when it went on display. A malfunction during the original mission meant that bullets could not be fired to collect samples; however, specks of dust from the asteroid were caught in the collection canister, meaning some material was returned for analysis. Shogo Tachibana, a cosmological chemist at Hokkaido University who is principal investigator for sampling for Hayabusa 2, hopes the material from the second mission will be free of contamination and therefore give a clearer insight into the early days of the solar system, unlike samples of meteorites that have crashed to Earth in the past. This article is part of a special focus issue of Physics World that draws together a selection of Physics World's recent articles about physics in Japan.